Chennai's Art,Culture,food and Shopping - Ghumakkar - Inspiring travel experiences. Dakshina Chitra , Beaches , temples , Amusement parks, Wild life , Heritage structures , Church etc ….It’s a never ending list at Chennai. Today I will tell you what else you can do apart from visiting Sightseeing points at Chennai. If you are at Chennai and you still have to spend few more days at Chennai and you have already visited Beaches, temples etc then The first thing which I will recommend is to visit Kalakshetra foundation website and search for programmes that are running. This is especially good for people who are fond of dance, music, drama, art and culture. 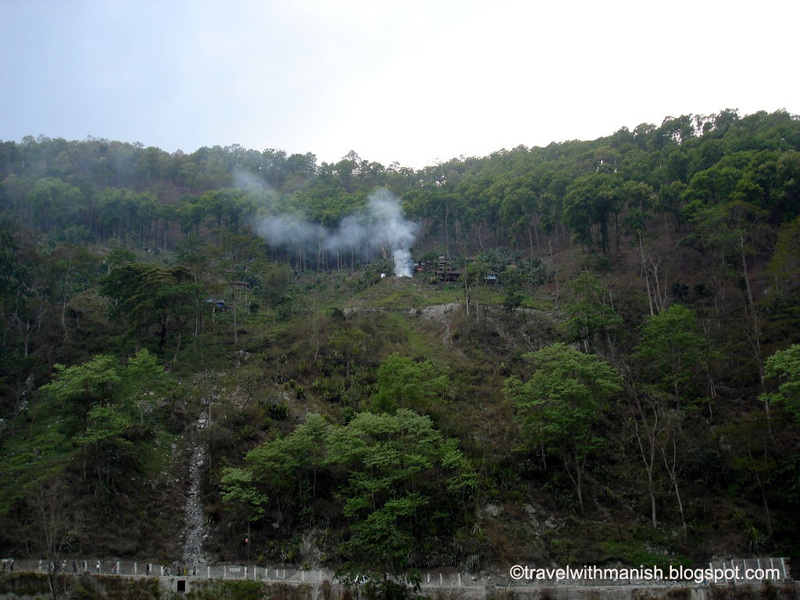 Even if you are not fond of all these ,still this place is worth visiting. I am fortunate enough to stay close to Kalakshetra Foundation and had always availed the opportunity to witness the wonderful program in the splendid eco friendly auditorium. My recent visit to Kalakshetra was in the month of February when Kalakshetra was celebrating a weeklong celebration in the remembrance of Rukmini Devi. a)Kalakshetra Foundation – Kalakshetra literally means a holy place of arts. Kalakshetra was established with the sole purpose of resuscitating in Modern India recognition of priceless artistic traditions of our country and of imparting to the young of India the true spirit of art, devoid of vulgarity and commercialism (Rukmini Devi words).Kalakshetra was established in the year 1936 by founding member Ms Rukmini Devi, her husband George Arundale and their associates at the Theosophical society. Program at Kalakshetra are generally free of cost except during Kalakshetra Annual festival during the final week of December and first week of January and the remembering Rukmini Devi festival in mid February. Kalakshetra can be visit on normal days also. The entry fee for foreigners is Rs 200/- and for Indian is Rs 50/-.Videography and photography is strictly prohibited inside the campus. The campus can be best seen on feet. There are many do’s and don’ts of visiting Kalakshetra .The details of all these rules like dress codes, tickets etc can be seen on the website. This time on the first day of Remembering Rukmini Devi festival we watched drama based on Devi Meenakshi. 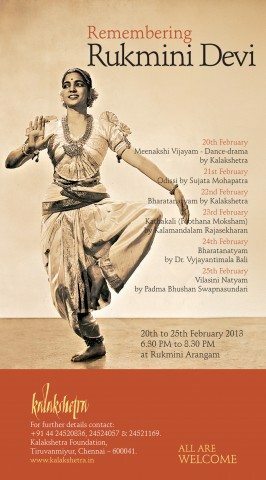 The dance drama name was “Meenakshi Vijayam”. I was very well aware that photography was not allowed inside the auditorium, but I couldn’t resist myself and just for sharing picture of such a wonderful place I clicked one picture only for the sake of sharing at Ghumakkar. As soon as I clicked photograph Kalakshetra students rushed to me and instructed that photography is not allowed. Still I managed with one picture.Others days I enjoyed watching superb Kathakali dance, Bharatnatyam , Kathakali based drama on the theme of save tigers, Exhibitions etc at Kalakshetra. This place is worth visiting if you are fan of Bharatnatyam, Kathak, Kathakalli, Kuchipudi, Musical dance drama and Music.The programm timings are generally from 1830 to 2030.So if you are planning to go there make sure you grab your chair by 1800 hrs else you have to stand for complete two hours. b)Mylapore Festival – It is the festival held during the second week of January around Kapeeleshwar temple at Mylapore. This festival is full of art, culture and tradition of South India .Program based on Folk dance, music, theatre and classical dance held outside the temple. Street theater performances and traditional music shows also happens at the street near to temple. Exhibitions on Indian crafts and other items were displayed during the festival. Various stalls were set up on the street offering Indian snacks and foods especially traditional food. The best part of this festival is Kolam contest (Rangoli). Around 100 Kolams were displayed on North Mada Street on weekends starting at 3:30 pm. The Kolams are left as an exhibit for few hours. Contest on traditional games, quiz, painting, chess etc also happened during festival.Its a beautiful festival but very crowded. So don’t take your kids in this festival. 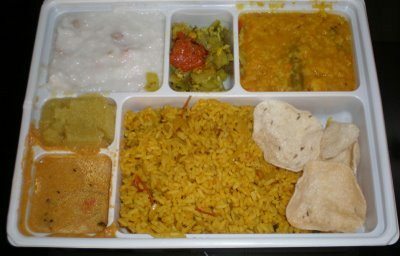 c) Chennai Food – Chennai is famous for its south Indian food mainly of rice. During your stay at Chennai do not forget to eat famous South Indian food at Chennai. 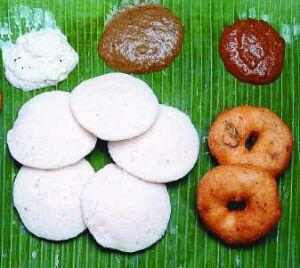 Idly, dosai, Uttapam are the dishes which are easily available all over India. So when you are at Chennai try eating Pongal, Khichudi and decoction coffee during breakfast which are not so common in other part of India. 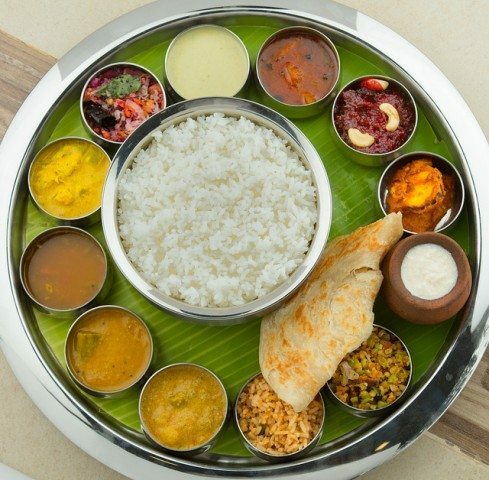 For Lunch try to have south Indian Thali or Mini meal comprising of Curd rice, Sāmbhar rice, Rasam rice and any one variety of Rice i.e. either Lemon rice, Tamarind rice etc. Chennai is also famous for non vegetarian food variety serving Chettinad non vegetarian cuisines. My most preferred restaurant to have South Indian meal is Sangeetha Restaurant. The restaurant chain is spread all over Chennai. Saravana Coffee house or Hot Chips or any local restaurant serves superb Decoction coffee. Murugan Idly shop serves Idly, Dosai, Vada , Uttapam.In my honest opinion I did not find very tasty food here but experience of eating Idly, vada on banana leaf served with four varieties of Chutneys and Sambhar (without spoon and bowl) is also a good experience. But the sad part here is if rice is not in your favorite food list then Chennai can be the place where Roti lovers will starve or empty their wallet by paying too much for much lesser Rotis. d)Chennai Shopping – Now the ladies section opens here (Please excuse us Mr. Gentleman). Is this true? Does man do not like shopping. I feel this is very wrong notion that Men do not like shopping. So from my side this part is for both ladies and Gents. When you are visiting Chennai and wanted to take along with you the Chennai’s item, then here is the list. 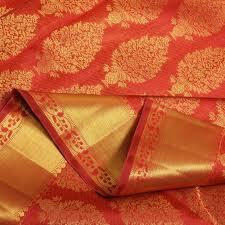 Chennai is famous for its Silk Sarees and Gold. Everyone who so ever visits Chennai make a point to carry nice Chennai Silk saree or Kanjivaram Saree. My advice is that if you are planning to buy saree , then go to shops like Pothys, Kumaran Silks , RMKV , Nallis , Sundari Silks or Chennai Silks which are popular silk saree shops . All these shops are at T.Nagar only. You will definitely going to get a good deal in all these shops. The main market area in Chennai is Theyagraja Nagar commonly refer as T.Nagar. One can find hundreds of Shops at T.Nagar. 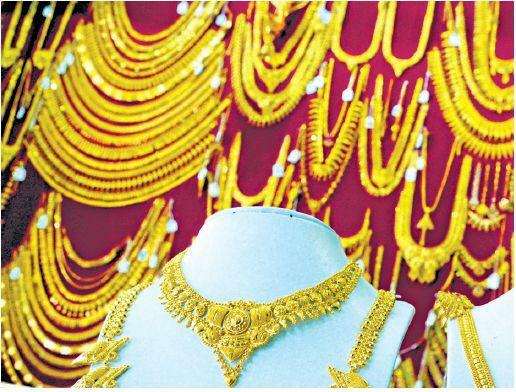 There are many Gold Jewellery malls/shops at T.Nagar offering varieties of Gold Jewellery. Shops like Joy Allukas, GRT Jewelers, VBSS Jewelers, Prince Jewelers, Mehta Jewelers, Khazana, and Lalitha Jewelers. In these shops each floor are dedicated to each Jewellery .For e.g. first floor would be dedicated only to Bangles, second floor only for Chain and earrings etc. It’s an experience one will never forget. Above are the most popular items to be purchased from Chennai. Now I will tell you to buy few small items. White Shirts and Dhotis – As Chennai is close to Tiruppur and people here at Chennai prefers to wear plain white clothes / good quality of cotton, you will find very good quality of white shirts and white dhoti. Try buying any of these items of brand like Ramraj cotton. 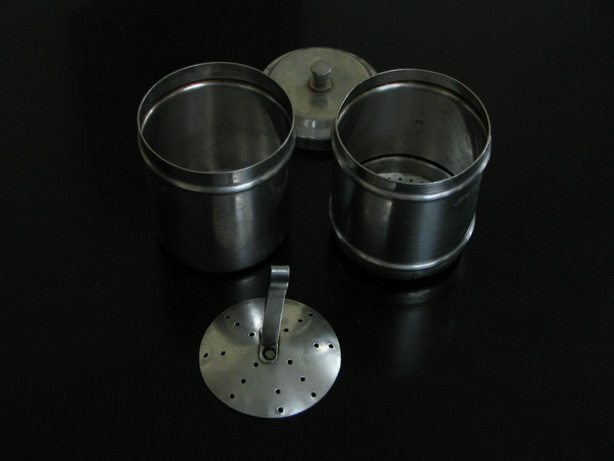 Decoction Coffee and decoction coffee filter – Decoction is a brewed coffee, that is usually mixed with milk and sugar. Or one can even say it is a liquid form of coffee prepared from decoction coffee filter. If you like Chennai Coffee then carry this small magical filter and local coffee powder and enjoy the best coffee. It will not cost you more than Rs 200/-. You can get this filter at Rathna Stores in T.Nagar. 3. Gold covering Jewellery – Gold covering jewellery is nothing but a one gm gold jewellery or which is popularly advertised in north as “Sone se kam nahi, kho jaaye to gam nahi”. Why I am suggesting this item. There is a very beautiful secret behind this type of Jewellery. Go to any of the big Gold Jewelers shop and choose the jewellery design. If the jewellery is in your budget buy Pure Gold jewellery, but if it is not in your budget then go to Gold covering jewellery shop and buy similar design jewellery from the Gold covering shop. I really like Sridevi gold covering jewellery shop at T.nagar for purchasing all south Indian style jewellery like Laxmi Haar, Jhumki , temple ear rings etc. 4. 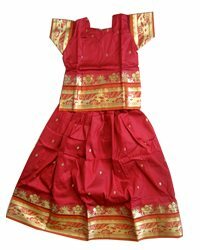 Pattu Pavada – It is the traditional south Indian dress for small girls. Buy this for your little angel of your life or for any sweet little girl. They will surely love this dress and it will definitely give real Chennai feeling. 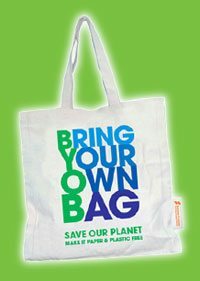 Take your own bag for groceries and vegetables. Next articleनन्हे शिवम की ओंकार परिक्रमा……….. Your post manifested the soul of Chennai. 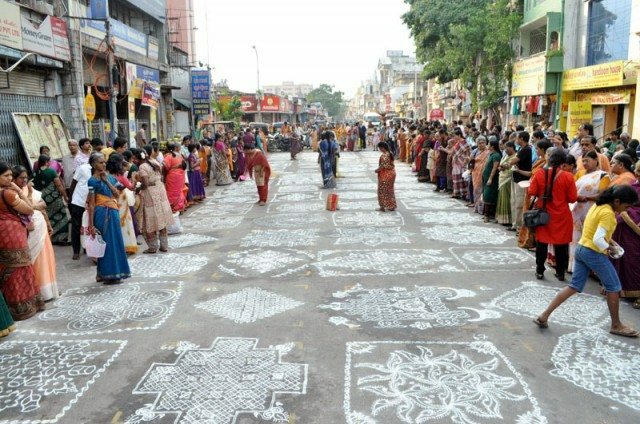 Wonderful to see a snap of Rangoli Competition @ Mylapore in a post on Chennai. Nice info. on the silk saree shops. Nice informative post. I think its a new angle/perspective to look at cities you love. Yes we roti lovers start starving after a couple of days in the south! It can’t be better than this especially for North Indians like me. Undoubtedly you are Brand ambassador of Tamil Nadu tourism though unofficially. Is she Rukmini Devi Arundale that had been talked about? Thanks Rakesh ji for liking and appreciating the effort and post. Apne ekdum sahi pehchana , She is Rukmini Devi Arundale. This series is turning out to be quite a comprehensive guide on Chennai. Your eye for details adds value to it. Public transport, probably, could be one area which you could include later – that is one issue which concerns the tourists. Superb informative series, looking forward to next parts. Thanks Aurojit for liking the post as well as series. I liked your suggestion of Public transport.I will surely try to collate information on same. Echo the comments of others. Interestingly, we were at Kalakshetra, Guwahati about 10 days back. I looked at the website link and they seem to be two different setups. The one at Guwahati is more of a government body where they showcase the work of artists from across Assam. Recommended for Ghumakkars. I have been to Chennai few times and I liked the city, in a sense that it looks like a old vibrant city with a lot of soul (to borrow Praveen’s words). I also have a white ‘Waist-y’ (I know it must be called different, look fwd to folks from Chennai/TN for more info) which I bought many many years back and still use and carry on my travels. This is like a business class version of Praveen’s loin cloth. I also bought a rooty ‘Gamcha’ recently from Guwahati. Thank you Abhee for the wonderful info on Chennai. Now you have moved to a new city so I guess you must quickly finish this series before the new place begins to grow on you. Many thanks and wishes. Thanks NJ . Good to know about Kalakshetra Guwhati. I have one more post for Chennai Diaries in my mind.So after that post I will pause my series and will start on Canada. BTW my start at Toronto was really good.Thanks to good.I got an opportunity to see CN tower and Ontario lake in the first weekend here.It was a hilarious experience.I will share soon. Thanks for liking the post and finding the information useful.